Hey you! Do you know that there’s an ongoing giveaway happening @ Happy Steps travel blog? You shouldn’t miss joining this one as the major prize is $150 in Paypal cash! yeah, $150 is a lot of money. Think of all the things you can buy or pay with it. Other goodies in store for winners are Ad spaces/links and Entrecard credits. So grab the chance and JOIN! Giveaway ends on September 25, 2012. Here’s the link to Happy Steps 5th Blog Anniversary Giveaway. Go ahead and click it! I have teamed up with I Heart Giveaways and all other awesome bloggers to bring you Lucky Day Giveaway! 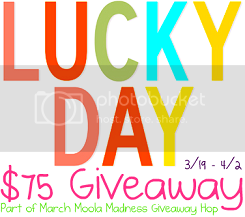 This event is part of March Moola Madness which will run from March 19 to April 2, 2012. Get a chance to win $75 Paypal Cash or Amazon Card of your choice. Open Worldwide. What are you waiting for? Enter the rafflecopter below and start submitting your entries. Good luck! Try your luck today and start hopping. Part of a business venture is advertising or promoting your company or product. Consumers love to receive samples and Promotional Items all the time. I do! Especially the useful ones like pens, mugs, tees or umbrellas. Well, there are too many to mention actually. So if you want to get the word around about your company, let promotional products do the job for you. You can get countless of ideas on what items you can give out for promos at Gimmees.com. They’re one of the biggest suppliers of promotional products in the net. They’ve got loads of products! I’m sure you’ll be amazed at number and the categories of items you can choose from in their website. I guess anything that can be imprinted on can be a prospect for promotional use. Anyway, if you think this kind of marketing strategy is too expensive for your budget, then here’s the good news. They have a bargains’ section where you can get products for less than a dollar! Isn’t that a good deal? September 9th, 2008what a surprise! You have been sent 225 Entrecard credits!. Who doesn’t? I was earlier reading Tricia’s blog called Tricia’s Musings and read about the site mysavings.com where you can request for free sample products and money saving coupons from different companies. Being fond of freebies I immediately checked out the site only to find out that Czech Republic isn’t included in the participating countries. They only offer samples to Ireland, UK, US, Australia, New Zealand and Canada. Awww too bad! However M was able to download the free Mozart MP3s for babies with the help of his UK connections. Yey! The music collection got good feedbacks from the reviews I read. I can’t wait to get hold of it when M comes home from his night off. If you’re living in those countries you should take advantage of the freebies they’re offering.